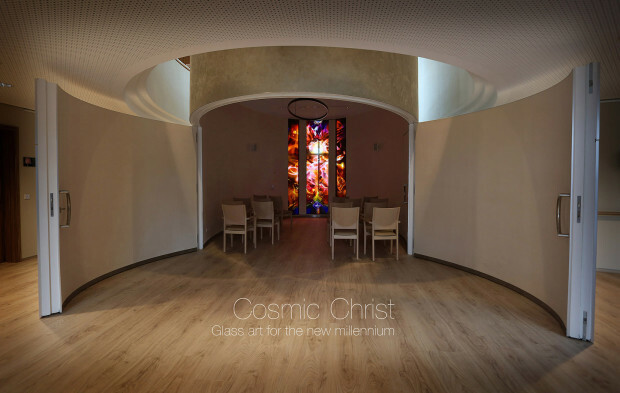 The mystical stained glass windows "Cosmic Christ" of the new Catholic Chapel of the Redeemer in the diocese of Mainz, made by the international glass artist Gabriel, reflect the increasing sympathy of the Catholic Church for a new cosmic spirituality - completely in the spirit of the Jesuit Father Pierre Teilhard de Chardin’s lifetime achievements. 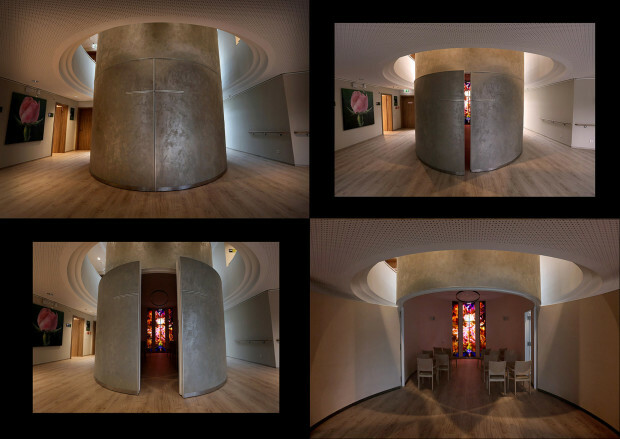 The chapel‘ s whole focus is based on contemplation of the sacred glass art: Visitors should be able to completely immerse themselves inside of the beautifully shaped timber-framed rotunda. The chapel acts as a space full of light for the soul: Salvation. Resurrection. Transcendence. 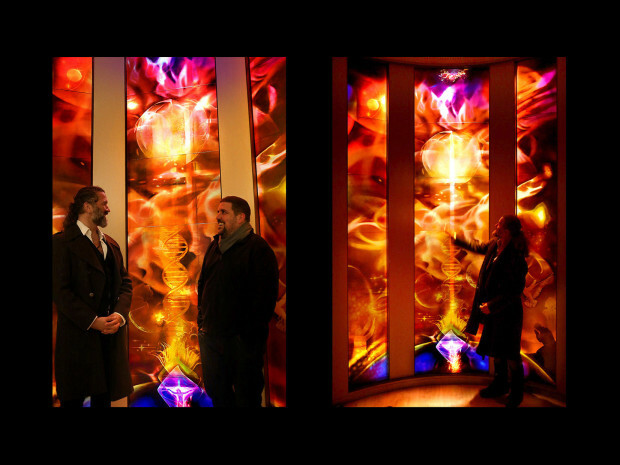 Gabriel dedicates his almost 4 meter high sacred triptych "Cosmic Christ" to the inspiring life's work of the Jesuit Father Pierre Teilhard de Chardin, who is currently being officially rehabilitated in the Vatican by a petition from the Cultural Council. Pope Francis clearly showed great sympathy for an all-embracing cosmic spirituality in his environmental encyclical "Laudato si!". In view of the zeitgeist of a recognizably deeper ecological crisis, he warned for a more universal and careful approach to the "common house of the earth" in the future. In doing so, he referred appreciatively to the life's work of Pierre Teilhard de Chardin, as his predecessors Benedict XVI and John Paul II had done before. 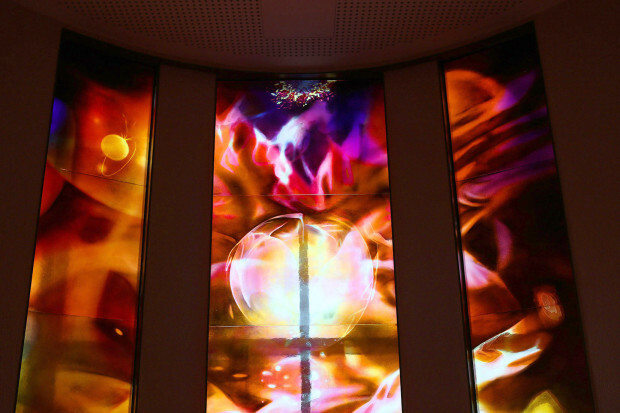 As early as 2015, Gabriel opened up new ways for the design of much smaller but more innovative church spaces with his hitherto extraordinary artistic concept for the new "Chapel of the Sun Song" (Laudes Creaturarum: Praise of the Creatures). At that time, he also made a direct visual reference to the Pope's environmental encyclical "Laudato si". Gabriel's current realization "Cosmic Christ" in the diocese of Mainz is trend-setting. The elaborate perfection of the photo-realistic etchings and the artistically condensed glass paintings in collaboration with his partner and papal glass workshops Derix on mouth-blown golden-pink coloured genuine antique glass from the German glass works of Lamberts, set new colourful light signals in modern sacred buildings. In the wake of increasing demolition and profanation of old churches, Gabriel now wishes as counteroffensive, for more innovatively thought-out designs of completely new, substantially smaller chapel concepts worldwide, which will enclose the Christian communities in an appreciably warmer and more sheltered atmosphere: smaller - finer - more versatile. 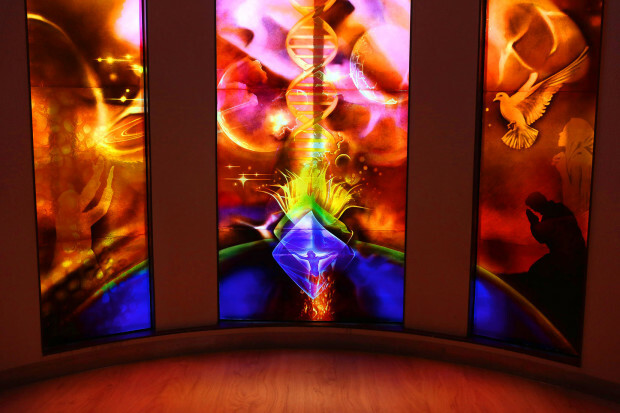 Above all touching, by virtue of the power of a completely new glass art – a symbolically, artistic transformation of the church and faith for the new millennium. A perfect cosmos of art, devotion and love. Teilhard de Chardin is for Gabriel a mystic who reconciles the Christian faith with a new cosmology: Christ revealed himself in the midst of a cosmic evolutionary process. He is the shining bridge that unites everything: Christ is the symbol of the highest human potential development in the actual process of cosmic evolution on earth. This "Christ-energy", which is deeply hidden in every human being, is waiting to be brought to life. 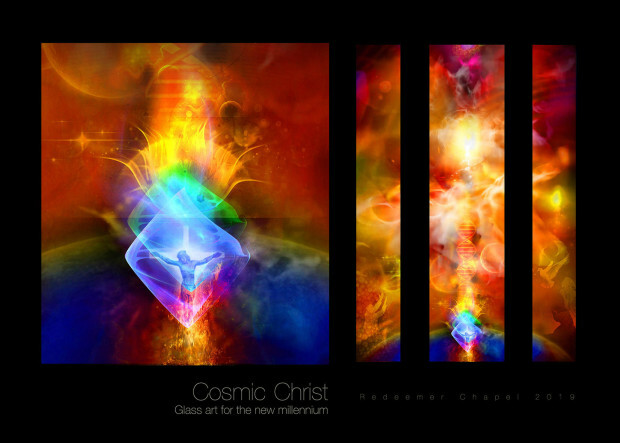 For Gabriel, the "Cosmic Christ" is ultimately the direct illumination of the Creator in Creation, which he expresses in his glass art in the Chapel.